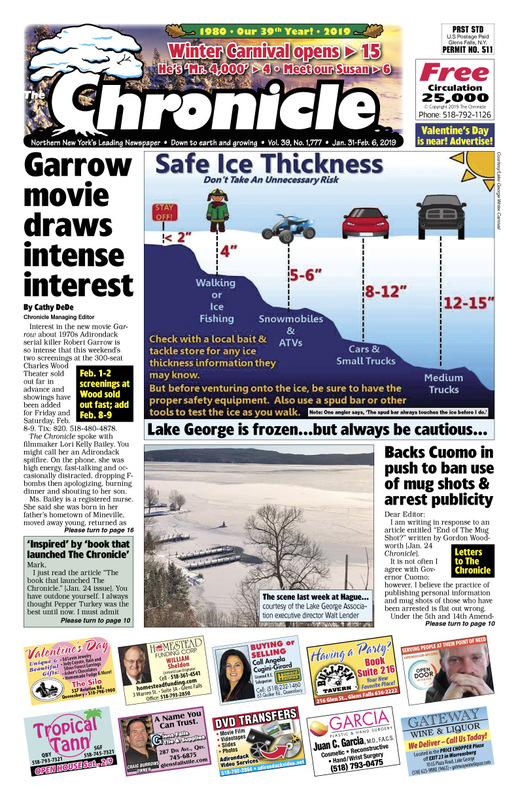 Lake George Winter Carnival issue | Garrow movie draws intense interest. When is Lake George ice safe? He’s ‘Mr. 4,000’ – Joseph Girard III. Who’s squeezed most by tax-exempt property? Travis Whitehead to run for Queensbury Supervisor. Elizabeth Miller, for $500,000, buys 15 Park, across from her Park Theater. Warren Cty. Sheriff race shaping up as Lamouree vs. LaFarr. Adirondack Trust sets branch east of Exit 18, at 79 Main St., Queensbury. Concerts, comedy, shows… The Chronicle always has the region’s best Arts & Entertainment section!